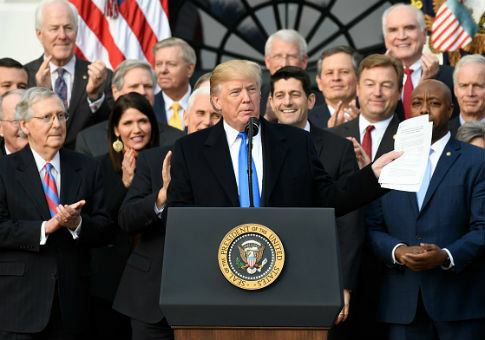 Eighty-one companies have announced that they will invest more in their workers—in the form of bonuses, higher wages, or other benefits—since President Donald Trump signed the Republican tax overhaul into law last month, according to a new report. Several companies are praising the tax reform plan and touting their moves to reinvest money that they expect to save from a lower corporate tax rate of 21 percent, Yahoo News reported Thursday. AT&T said that it will give $1,000 special bonuses to more than 200,000 employees and invest an additional $1 billion in the U.S. Similarly, Bank of America announced $1,000 bonuses for 145,000 employees. Other companies have focused on improving facilities. Boeing invested $300 million in "workplace of the future" facilities, infrastructure, and workforce development. The aerospace giant also said that it will increase its philanthropic giving. Walmart, the largest private employer in the world, was the latest company to join the list. On Thursday, the company announced that it will increase its minimum wage from $9 to $11, along with increases in paid maternity and parental leave. "Tax reform gives us the opportunity to be more competitive globally and to accelerate plans for the U.S.," Walmart CEO Doug McMillan said. Other companies have also indicated that they will increase their minimum wages, included banks. Wells Fargo said that it will raise its minimum wage for American employees to $15 an hour. The bank also plans to increase its philanthropic giving by 40 percent in 2018 to $400 million. Fifth Third will raise its minimum wage to $15 an hour for employees and give bonuses of $1,000 to more than 13,500 employees. This entry was posted in Issues and tagged Boeing, Comcast, Tax Reform, Walmart. Bookmark the permalink.